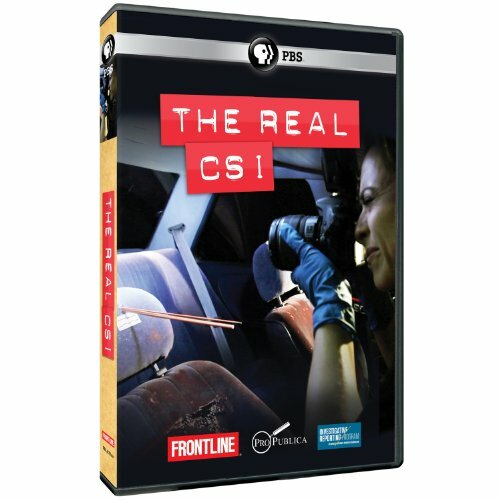 Arlington, Va. - May 14, 2012 - PBS Distribution today announced it is releasing Frontline: The Real CSI on DVD. Evidence collected at crime scenes -everything from fingerprints to bite marks - is routinely called upon in the courtroom to prosecute the most difficult crimes and put the guilty behind bars. And though glamorized on commercial television, in the real world, it's not so cut-and-dried. A joint investigation by FRONTLINE, ProPublica and the Investigative Reporting Program at UC Berkeley examines the reliability of the science behind forensics in Frontline: The Real CSI . FRONTLINE correspondent Lowell Bergman finds serious flaws in some of the best-known tools of forensic science and wide inconsistencies in how forensic evidence is presented in the courtroom. From the sensational murder trial of Casey Anthony to the credentialing of forensic experts, Bergman documents how a field with few uniform standards and unproven science can undermine the search for justice. Frontline: The Real CSI will be available on DVD beginning June 26, 2012. The program has a running time of 60 minutes. The DVD SRP is $24.99. The investigation follows a landmark study by the National Academy of Sciences that called into question the tenets of forensic science. For the first time, Harry T. Edwards, a senior federal appellate court judge and co-chairman of the report, sits for an interview to discuss what the report means. He tells FRONTLINE that these television dramas often exaggerate or misrepresent the reliability of forensic evidence, including one of the most called-upon of the forensic techniques, fingerprint identification. "If what some people are saying, it works because we've gotten convictions, ... that's not proof that the discipline is undergirded by serious science," Edwards tells FRONTLINE. "It's been inaccurate and wrong for many years. It doesn't become better because it's many years. It's just many years of doing it incorrectly. ... And the stakes are too high. When you're talking about prosecution, incarceration, the stakes are too high. In this hour, FRONTLINE also examines one of the most high-profile terrorist investigations since 9/11: the case of Brandon Mayfield, an attorney who was wrongfully identified and arrested as a suspect in the Madrid commuter train bombings after the FBI erroneously matched his fingerprint to a partial print found at the scene. The case exposed the weaknesses of fingerprint identification, causing the FBI to change the way its examiners testify about the reliability of forensic fingerprinting. Bergman interviews the fingerprint expert selected by Mayfield's defense, the independent examiner Ken Moses, who concluded it was a positive match for Mayfield, but later admits that he and the three other examiners who looked at the prints were wrong. The Mayfield case highlights the weak link in fingerprint analysis - the examiner, whose work is not done by a computer, as seen on TV, and can be influenced by unconscious bias. The reporting reveals that bite-mark identification is another one of several seriously flawed forensic tools used in criminal investigations. "What we're talking about with forensic science is systemic failure," Innocence Project co-founder Peter Neufeld tells Bergman. "We're talking about using techniques, using equipment that's never been validated scientifically." In the small town of Brooksville, Miss., FRONTLINE explores the errors that led to the convictions of two innocent men, whose convictions in part were based on faulty bite-mark testimony. "There have been a number of people who were convicted based on bite-mark testimony, who were sent to death row or sent to prison for life," says Neufeld. "And in each of those cases, a whole group of forensic odontologists, or dentists, said they were absolutely certain that this was the guy, ... and they were absolutely wrong." Nowhere in recent history has forensic evidence been more prominent than in the trial of Casey Anthony, who was acquitted of the first-degree murder of her 2-year-old daughter, Caylee Anthony. Based on a smell from the trunk of Casey Anthony's car and using an expert in "the odor of the dead," the prosecution set out to convince the jury that the stench was that of a decaying body. In total, 37 expert witnesses from more than a dozen areas of forensics testified, with the defense challenging with forensic experts of their own. "This case utilized every single type of forensic science. ... They threw a bunch of stuff against the wall, and they were hoping something would stick, and none of it did," says defense lawyer Jose Baez. FRONTLINE also examines what it takes to become credentialed in forensics by the American College of Forensics Examiners International (ACFEI). "It was like an open-book exam basically, and I passed," says Leah Bartos, a journalism graduate student at UC Berkeley, who demonstrates that for $660 and a few hours taking an open-book exam online, she became certified as a forensic consultant by ACFEI. Bergman's interview with former CEO John Bridges indicates that 99 percent of those who apply online will become certified by the organization. "There can be no meaningful exam that has a 99 percent pass rate," admits forensic guru and ACFEI spokesman Cyril Wecht, whose signature appears on ACFEI certificates. The Real CSI is a FRONTLINE production in collaboration with ProPublica and the Investigative Reporting Program at UC Berkeley. "THE REAL 'CSI'" is part of an ongoing look at forensic science that has engaged FRONTLINE and its partners over the last two years. The producers and writers are Andres Cediel and Lowell Bergman. The correspondent is Lowell Bergman. The reporter for ProPublica is Leah Bartos. The series senior producer of FRONTLINE is Raney Aronson-Rath. The executive producer of FRONTLINE is David Fanning. ProPublica is an independent, nonprofit newsroom that produces investigative journalism in the public interest. In 2010, it was the first online news organization to win a Pulitzer Prize. In 2011, ProPublica won the first Pulitzer awarded to a body of work that did not appear in print. ProPublica is supported primarily by philanthropy and provides the articles it produces, free of charge, both through its own website and to leading news organizations selected with an eye toward maximizing the impact of each article. For more general information, please visit www.ProPublica.org. FRONTLINE is produced by WGBH Boston and is broadcast nationwide on PBS. Funding for FRONTLINE is provided through the support of PBS viewers and by the Corporation for Public Broadcasting. Major funding for FRONTLINE is provided by The John D. and Catherine T. MacArthur Foundation and by Reva and David Logan. Additional funding is provided by the Park Foundation and the FRONTLINE Journalism Fund. FRONTLINE is closed-captioned for deaf and hard-of-hearing viewers by the Media Access Group at WGBH. FRONTLINE is a registered trademark of WGBH Educational Foundation. PBS Distribution is the leading media distributor for the public television community, both domestically and internationally. Jointly owned by PBS (Arlington, VA) and WGBH (Boston, MA), PBS Distribution extends the reach of public television programs beyond broadcast while generating revenue for the public television system and our production partners. ��PBS Distribution offers a diverse range of programming to our customers, including Ken Burns's films (Prohibition, The National Parks, The War, Baseball, Jazz), documentaries from award-winning series NOVA (The Elegant Universe, Origins), FRONTLINE (God in America, Bush's War, Growing Up Online), and American Experience (Freedom Riders, We Shall Remain), dramas from Masterpiece (Downton Abbey, Jane Eyre, Inspector Lewis), films from independent producers (Easy Yoga for Arthritis, The Buddha, The Story of India, Carrier, Journey into Buddhism, I.O.U.S.A. ), and popular children's programming from Dinosaur Train, Super Why!, WordGirl, Cyberchase, Martha Speaks, and Arthur. As a multi-channel distributor, PBS Distribution pursues wholesale/retail sales, consumer and educational sales through PBS- branded catalogs and online shops, and international broadcast and video sales. PBS distribution is also a leader in offering programming through digital platforms including the internet, mobile, and web-connected television.